Historical fiction is my vice. I am a busy mom of boys who truly does not have much time for anything extra. However, when i find a good read, I make the time to enjoy it. The Girl in the Gatehouse was a fantastic book and was totally worth my time. It takes place in the Jane Austen era, a personal favorite of mine. Once I find an author whose style I enjoy, I read all of their books. It appears I am now working my way through Julie Klassen’s titles! 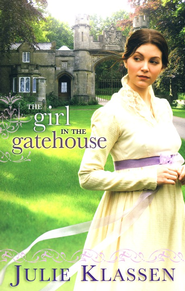 The heroine of the Girl in the Gatehouse is Mariah Aubrey who is like so many girls in that she makes a mistake she can’t outrun. Her father is less than forgiving and sends her away with little money and her childhood governess. Mariah struggles to overcome her past while dealing with her present. On a stormy night, Mariah meets Captain Matthew Bryant who is headed down a very different path. Author Julie Klassen does a beautiful job of bringing these two characters together in such a way that insures I will be reading this lovely novel again.